Since 1990 Schrödinger has been pushing the limits of applying mathematics, physics, and technology to make drug development and energy storage more efficient. Currently, Schrödinger has over two dozen drug discovery projects in the pipeline that are in various stages of pre-clinical and clinical development. The drug discovery and software company has also cofounded leading biotech companies like Nimbus Therapeutics and Morphic Therapeutic. Taking a unique approach, the company has been pioneering innovation in the drug discovery space through software. AlleyWatch sat down with SVP of Corporate Communications Shi-Yi Liu to learn more about how Schrödinger continues to make waves, future plans, and the company’s most recent funding round. 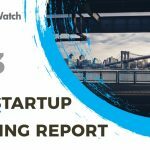 This round brings the total reported equity funding to $137M with an impressive roster of investors on the cap table. We raised $85M in Series E funding. The Bill and Melinda Gates Foundation Trust and WuXi AppTec’s Corporate Venture Fund co-led the round, joined by leading life science and tech investors Deerfield Management, Baron, Qiming Venture Partners, and GV (formerly Google Ventures). Tell us about the product or service that Schrödinger offers. Schrödinger is best known for developing a physics-based software platform that allows for efficient in silico drug discovery and materials design. Top pharma and biotech companies around the world license the software, as well as many global organizations engaged in materials research. But Schrödinger has more than software developers on staff: we have also built an extensive drug discovery team focused on maximizing the benefits of leveraging our technology. In recent years, Schrödinger has formed research collaborations and joint ventures with partners who have strong insights into particular targets or indications. For example, we cofounded the successful biotech startups Nimbus Therapeutics and Morphic Therapeutic and have partnerships with global pharma leaders Takeda and Sanofi, among others. In just the past few months, we’ve announced new research collaborations with TB Alliance and SPARC and launched a new drug discovery startup with WuXi AppTec. What inspired the start of Schrödinger? Schrödinger was founded in 1990 by Richard Friesner and Bill Goddard. At the time, it was purely a software company, focused on quantum mechanics methods. The vision was to use physics-based approaches to understand molecular properties and interactions in a deep and rigorous way which would in turn solve problems not possible with existing, traditional methods. Powered by 25+ years of intensive R&D, Schrödinger has developed an industry‑leading advanced computing platform for life sciences and materials research. In industries as diverse as drug development and energy storage, our predictive modeling and collaboration tools empower teams to break through old paradigms and discover unexpected solutions. Specifically, our rigorous FEP (free energy perturbation) software, FEP+, leads the industry in computational methods to identify highly potent drug candidates. In a recent blinded study, our software went head to head with humans to identify the best potential therapeutic molecules for a target; our software was correct 80% of the time, while humans were correct only 10% of the time. What market does Schrödinger target and how big is it? Schrödinger is a leading provider of advanced molecular simulations and enterprise software solutions that accelerate and increase the efficiency of drug discovery and materials design. 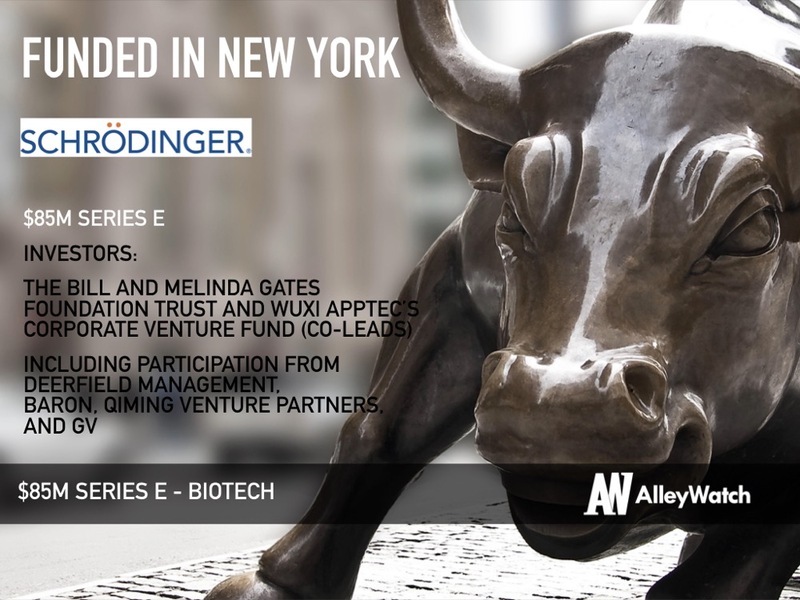 Schrödinger has a growing pipeline of early-stage assets and has cofounded leading biotech companies, including Nimbus Therapeutics and Morphic Therapeutic. In addition, the company has deep partnerships and collaborations in such fields as biotechnology, pharmaceuticals, chemicals, and electronics. Schrödinger receives substantial annual revenue from licensing the software platform; we also receive milestone-based payments on a number of our collaboration projects and have equity stakes in joint ventures. We currently have more than two dozen drug discovery projects underway in various stages of pre-clinical and clinical development. 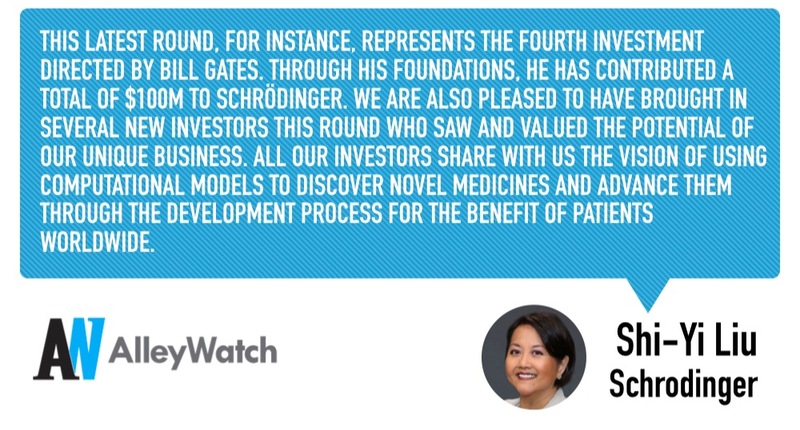 We’ve been fortunate to have supportive investors who have backed our work in multiple rounds. This latest round, for instance, represents the fourth investment directed by Bill Gates. Through his foundations, he has contributed a total of $100M to Schrödinger. We are also pleased to have brought in several new investors this round who saw and valued the potential of our unique business. All our investors share with us the vision of using computational models to discover novel medicines and advance them through the development process for the benefit of patients worldwide. 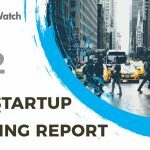 Because we have a unique business model, we have a very successful software business, as well as a nascent yet thriving effort to carry out drug discovery in partnered and proprietary programs. That sometimes makes it more challenging for the potential investor to model the value of the company — we don’t fit neatly into the box of either a pure software company nor a traditional biotech. It is precisely the synergy of our combined business that truly powers our growth and future value creation. The demonstrated success in our computational platform that uses physics-based modeling to improve drug discovery. We plan to add significant new staff to our R&D and drug-hunting teams, allowing us to accelerate our drug discovery work and expand the capabilities of our software. Keep working hard and persevere in your own unique competence; don’t chase hype or fast-fading trends. 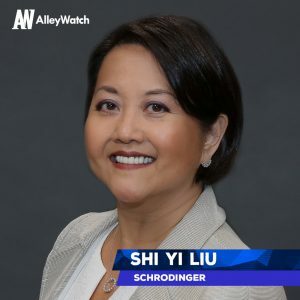 This round will finance a significant expansion of both Schrödinger’s R&D team, which works to improve and expand its computational platform, and Schrödinger’s drug discovery team, which works on the partnered and proprietary pipeline.